The second day of the UNLV Invite saw the Runnin’ Rebel men go undefeated, while Lena Gavrilova was a part of three wins on the women’s side. In addition, talented Fresno Pacific breaststroker Kendall Swanson came in just about half a second shy of the NCAA Division II record in the 100 breast, and UNLV post-grad Katelyn Herrington had a quick swim to win the 100 fly. It was a straight sweep for the home team on the men’s side, with Runnin’ Rebels winning all 7 events. Right off the bat, the 200 medley relay team of Henrique Machado, Boris Kulizhnikov, Dillon Virva and Or Sabatier combined to go 1:28.27 and win by over two seconds. Virva (21.1 on fly) and Sabatier (19.4 on free) were the heavy hitters of the relay, though all four had the field’s best splits in their respective strokes. Fresno Pacific was second in 1:30.66. Machado, Virva and Kulizhnikov went on to win individual races for UNLV. Virva and Machado went 1-2 in the 100 fly, with Virva leading in 48.13. (Machado was 49.08). Machado came back later on to win the 100 back in 49.14, another UNLV 1-2. Kulizhnikov took the 100 breast, going 56.06, with Fresno Pacific’s Connor Greene second at 56.78. That’s the second individual win so far for Kulizhnikov, who took the 200 IM on day 1. Also winning individual events for the Runnin’ Rebels: Matt Roe in the 400 IM (4:00.75) and Tom Paco-Pedroni in the 200 free (1:37.30). UNLV ended the night with an 800 free relay win, pairing Paco-Pedroni and Kulzhnikov with Joseph Riggert and Forrest Beesley to go 6:37.76. The best split came from Paco-Pedroni at 1:35.76, and UNLV won by almost ten seconds, with Fresno State once again second. The hosts won the first two events and last two events on the women’s side to maintain their lead, though Fresno Pacific and the University of the Pacific were strong through the middle of the session. 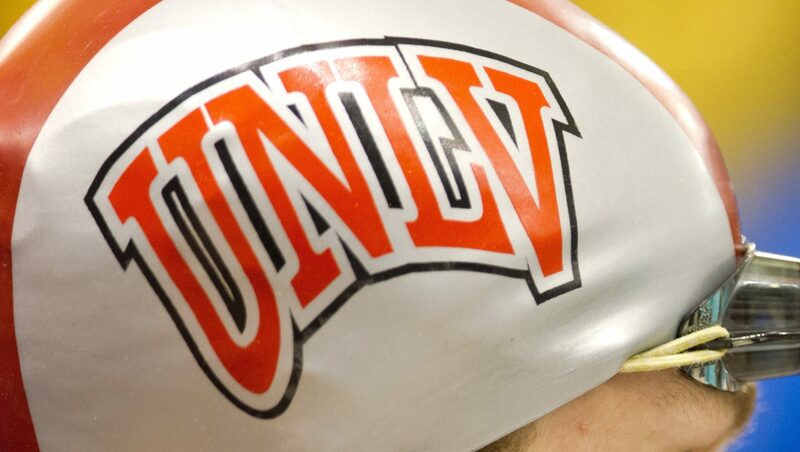 UNLV took the 200 medley relay to start things off, going 1:40.12. That team included Lena Gavrilova, Lina Rathsack, Jessica Wong and Julia Fehervari. Fehervari, the individual 50 free winner last night, was 22.45 on her leg, and all four Rebels had the fastest splits in their strokes. Gavrilova went on to win an individual race, the 100 back at the end of the session. After leading off this medley in 25.43 (the field’s best by about .8), she went 54.35 in the individual 100 back, the best time by just under two seconds. Fehervari and Gavrilova would return to help the 800 free relay take a win to close the session. Fehervari showed off her range, leading the relay off in 1:52.10, and Gavrilova was 1:52.33 on her anchor leg to take a third win on the day. Fastest on that relay was Michelle Troup, who split 1:51.66, and the team also got a 1:52.45 from Kelsey Wuoti to go 7:28.54. UNLV’s Kristina Hendrick also picked up an individual title, going 4:22.29 to just touch out Northern Arizona’s Kendall Brown (4:22.75) for the 400 IM win. University of the Pacific’s Margaux Verger Gourson won her second race of the weekend, going 1:48.46 to dominate the 200 free. Fresno Pacific got a win of its own in the next event, when Kendall Swanson blasted a 1:01.27 to take the 100 breast. Swanson had a breakout first day, putting up one of the fastest 100 breast relay splits in Division II history. Her time in the final tonight leaves her just six tenths off the NCAA record in Division II. Also taking an event was UNLV postgrad Katelyne Herrington, a former Mountain West champ and All-American. She showed off her speed with a 52.89 win in the 100 fly. The top collegiate finisher was New Mexico State’s Dorottya Lennert at 53.99. The meet wraps up tomorrow with prelims and finals.